In between acting as a dairy cow ( I’m gonna start moo-ing) to my always hungry baby, I managed to finish this quilt. Actually I’ve been sewing my head off while I’ve had extra hands entertaining my 3 year old during the day. I finished this one with simple quilted zig zag’s and backed it with a moda orangish red print I can’t remember the name of. It turned out great. My babies were the same way. I remember trying to finish my masters thesis in between nursing. It felt like I was just getting going when he'd need to eat again. Hang in there. That's my favorite so far! I love it! Oh Allison I just LOVE this one!! The colors are so bright and fun!! In to my must quilt someday file! I just love this one! It is so cheery and fun! Nice job! This is so beautiful, such an inspiration! I want to make one like this right now! So simple but so unique! The fabric choices for this one are limitless. I, too, am going to put it in my "someday-must-do" file. Thanks for sharing. Cute quilt! I love the colors and feel of it. I'm a milkin' mama, too. What makes it reallllly special is that my husband actually grew up on a dairy farm, so the cow jokes are plentiful 'round here. Mooooooooo! 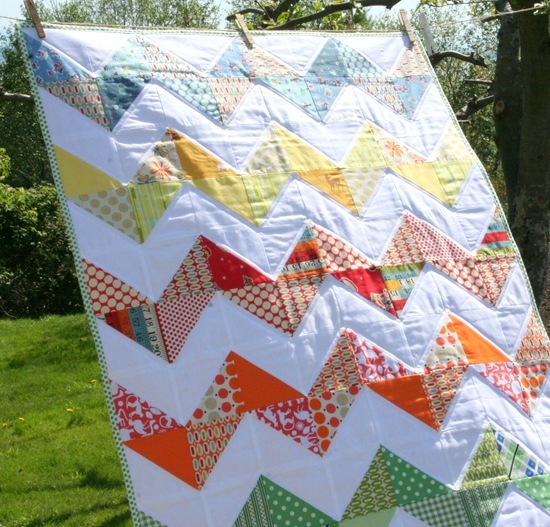 I love this zig-zag quilt! I intend to make one this summer, so thanks for the inspiration. I love this quilt and the fabrics you chose! Awesome! I can't believe you are finding this much time to quilt. You are on fire! Good thing milk isn't flammable. I'm almost done with my first zig zag quilt top. As far as quilting, do you just quilt along the edges of the zig zags? What did you use to keep it even and uniform? Did you use the foot as a guide? Did you have to use a walking foot? It looks beautiful. After all this work, I don't want to mess up my quilting. ..looks soooo nice & i love it. Well done the colours make me smile. So nice this Zig Zag quilt. Colours are perfect for the summer! Just beautiful from one moo cow to another! I always wanted a shirt that said "Got Milk!" Love this little quilt…want to make one. Binding and backing is adorable! I love LOVE this quilt! This is really lovely. 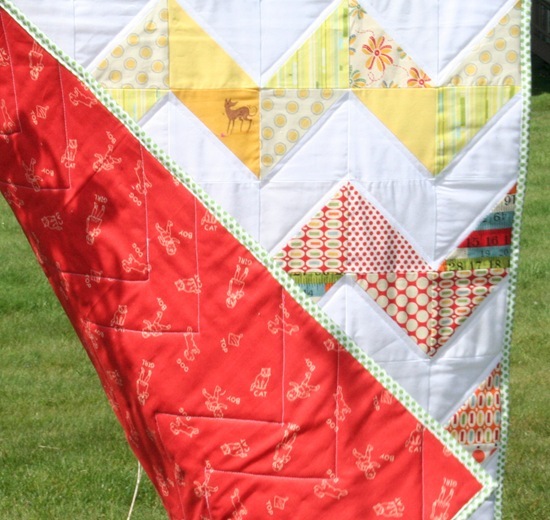 I like the fact that you kept the quilting nice and simple too.I'm sure the babies out there will love it too…. LOL I know what you mean at least you do not have to pump the rest out like I had to do. Hang in there it will get better. Your quilt is beautiful and you must be happy it is finished. so beautiful, I am dying to make me one of these! I love the yellow bambi fabric, what is it? Deer are now my favourite animal after feeding wild ones in Japan! Your quilts are so pretty, I love them all! Love it, so bright and cheerful. I LOVE this quilt!! So bright, cheery and happy…I got to make me one!! Thanks for sharing!! it's beautiful! I love the colors and fabrics you used! I love your quilts! I was wondering what kind of white fabric you use or would recommend? My email address is bork88@gmail.com. I absolutely love this quilt! Although I can hold my own with a sewing machine, I'm pretty new to quilting. Would it be easy to re-size this quilt larger? Or do you have a pattern for a larger size? gorgeous quilt! inspiring me to make my first…. question, how big a quilt does this make?